Supported by a reinforced frame under the platform, the PT stainless steel scale can accommodate substantial loads. Simple and stylish, the Swift offers a speedy weighing and price-computing solution for retail operations. EC type approval means Swift is ideal for trade, making it suitable for use by businesses selling products by weight. With speedy setup and easy operation, Adam Equipment's robust industrial scales meet the challenge of rigorous applications in a diverse array of settings. Our industrial scales are designed to be rugged enough for use in harsh field environments, demanding factory locations, and warehouses. 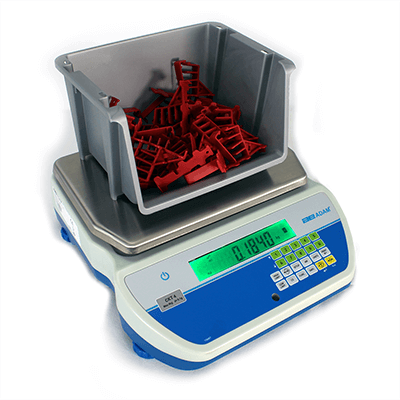 Counting scales are used in a wide variety of industries for parts counting, packaging, and stock taking. Carrying cases and battery options allow portability, making our industrial scales well-suited for soil testing and construction use in the field. Adam scales require minimal training to operate, saving time and money on a variety of weighing and counting tasks in the MRO (maintenance, repair and operations) sector. In shipping, receiving, and warehouse operations, Adam's sturdy platform scales are used for safely weighing pallets, drums, and containers of all shapes and sizes. Professionals worldwide turn to Adam for industrial weighing solutions that deliver speed, performance and value. Hanging scales, also called crane scales, work a bit differently than ordinary scales.